Astronomers using the National Science Foundation's Very Large Array (VLA) radio telescope have greatly strengthened the case that supermassive black holes at the cores of galaxies may have formed through mergers of smaller black holes. Their VLA studies showed that a globular star cluster in the galaxy M31 probably has a black hole with 20,000 times the mass of the Sun at its core. "That amount of mass is midway between the black holes left when giant stars explode as supernovae and the supermassive black holes with millions of times the mass of the Sun. It suggests that there is a clear path for forming the supermassive ones through successive mergers of smaller black holes," said James Ulvestad, of the National Radio Astronomy Observatory. Ulvestad, Jenny Greene of Princeton University, and Luis Ho of the Observatories of the Carnegie Institute of Washington presented their findings to the American Astronomical Society's meeting in Honolulu, Hawaii. Black holes appear to be intimately connected with the formation of massive spherical bulges in galaxies. Astronomers have found a direct relationship between the mass of the black hole in such a galaxy and the mass of its central bulge. However, it is unclear whether small galaxies contain smaller black holes, and their discovery may lead to new insights about the impact of black holes on galaxy formation. As Greene stated, "In recent years, we have been detecting black holes with masses between 100,000 and a few million times the mass of the Sun, but less massive objects have been exceptionally difficult to find." Based on observations with optical telescopes, Karl Gebhardt of the University of Texas at Austin, R. Michael Rich of UCLA, and Ho, suggested in 2002 that the globular cluster G1 in the Andromeda Galaxy (M31) contains a compact concentration of mass that is intermediate in mass between stellar and supermassive black holes. Other researchers disputed that conclusion. According to Ho, "In 2005, we obtained better data that clinched the case that the cluster really does contain a dark object with 20,000 times the mass of the Sun. What we can't be sure of, however, is whether the dark mass is a single object --- that is, an intermediate-mass black hole --- or a cluster of smaller dark objects such as neutron stars or stellar-sized black holes." "Since this globular cluster, G1, is by far the best candidate for containing such an intermediate-mass black hole, we felt it was important to help resolve the question," Ho added. Last year, researchers detected X-rays emitted from G1. That allowed Ulvestad and his team to apply a test that could distinguish between an intermediate-mass black hole and the smaller compact objects. Astronomers have found that, for a given X-ray brightness, a supermassive black hole is much brighter at radio wavelengths than a stellar-mass black hole. Using the VLA, Ulvestad, Greene and Ho found that the radio brightness of G1 was between what would be expected for a stellar-mass black hole and what would be expected for a supermassive one. "The radio brightness nicely fits the prediction for a 20,000-solar-mass black hole," Ulvestad said. Some globular clusters in our own Milky Way galaxy are suspected to contain black holes with masses just a few hundred times the mass of the Sun. 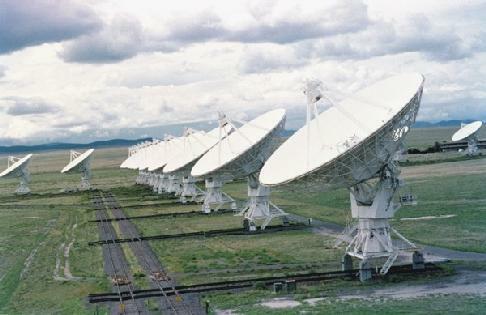 These may be detected when the Expanded VLA, with much greater sensitivity than the current telescope, comes on line soon after 2010. "With this capability, we could close the gap between black holes with masses 10 times that of the Sun and those with masses more than 10,000 times that of the Sun," Ulvestad said. "This should lead to a greater understanding of their importance as stepping stones toward the most massive black holes we observe in the centers of many galaxies."